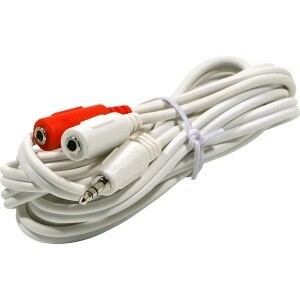 This is a white, 6 ft long, shielded 3.5mm (1/8") stereo jack splitter cable. This cable has a stereo 3.5mm male plug on one end, and two stereo female 3.5mm jacks on the other end. This cable will allow you to plug two sets of stereo headphones into one jack.